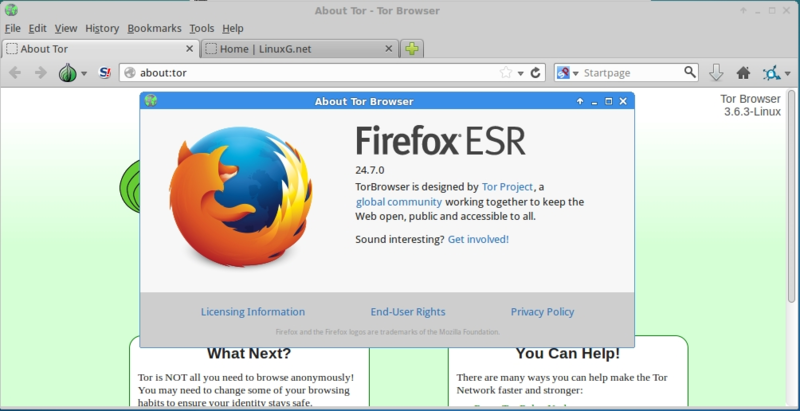 The latest version available is Tor Browser 3.6.3, which has been recently released. Among others, it now uses Firefox 24.7.0ESR as base and comes with updated plugins: obfsproxy 0.2.12, FTE 0.2.17, NoScript 2.6.8.33, HTTPS Everywhere to 3.5.3 and a bunch of bug-fixes have been implemented. In this article I will show you how to install Tor Browser 3.6.3 on Ubuntu, Linux Mint, Elementary OS, Pinguy OS, LXLE, Deepin, Linux Lite, Peppermint, Debian, Kwheezy, Crunchbang, SparkyLinux, Fedora, CentOS, OpenSUSE, Mageia, OpenMandriva, Arch Linux and Manjaro. Because Tor Browser Bundle 3.6.3 is not available via any repository yet, we have to download Pale Moon from the project’s site, extract the archive, move to /opt and alias the launcher. Yes! It worked. I see that 3.6.4 is the latest version, so I just followed your instructions and typed in 3.6.4 (not 3.6.3) when needed and I’ve got the latest version. Thanks so much for your help. Great website!